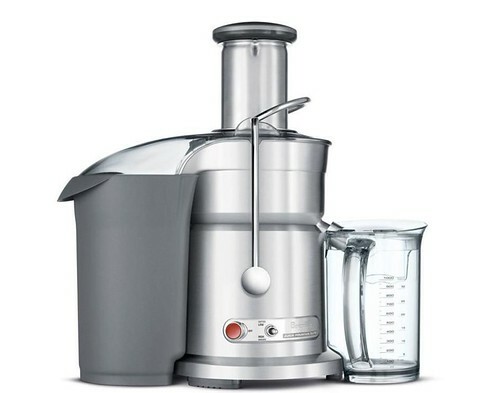 The Breville Juice Fountain® Elite — The compact design is packed with power. It collects pulp within the footprint of the unit to conserve counter space. 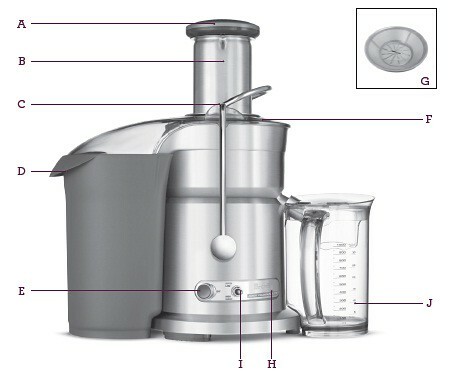 Yet it delivers all the power and performance you’d expect from a Breville juicer. A. Food Pusher. B. Patented Extra Wide Feed Chute. C. Safety Locking Arm. D. Large Pulp Container. E. Off Button. F. Juicer Cover. G. Stainless Steel Nutri Disc™. H. High Performance 1000 watt motor. I. Two-Speed Electronic Control. J. 34fl. oz. (1 liter) Juice Jug.